I’m excited to announce Google Maps 5.0 for Android, with two significant new features: 3D interaction and offline reliability. We launched Google Maps for mobile a little more than five years ago. Since then, we’ve added dozens of features, and we’ve grown from a few thousand to more than 100 million users. Still, a couple of things have remained the same: a flat, north-up map and the need for a strong Internet connection. Today, we’re changing that for the first time. 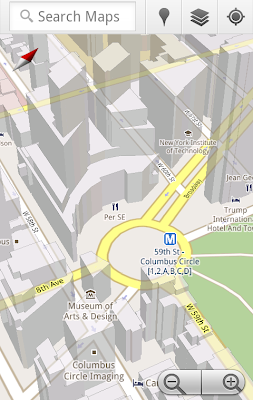 Tilt while zoomed in (left) or use compass mode (right) to orient yourself with 3D buildings. Tilting: Drag down with two fingers to tilt the map. 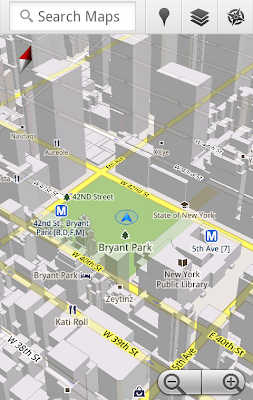 Tilt while zoomed in on one of the 100+ cities around the world with 3D buildings to see a skyline spring to life. 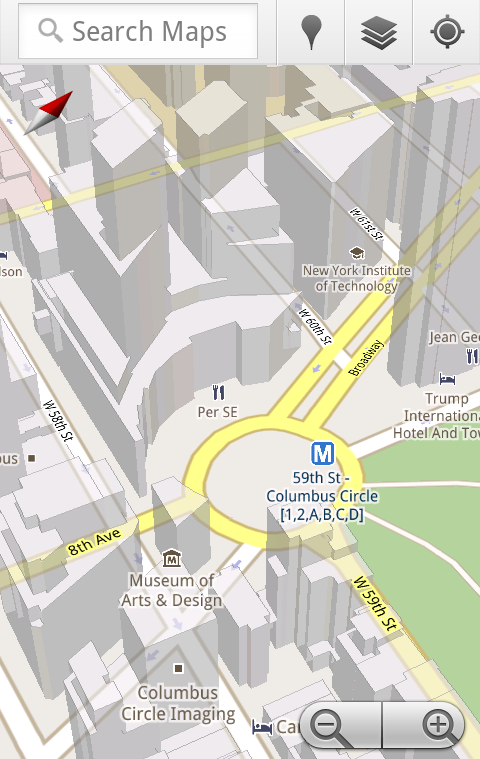 I found 3D buildings especially useful on a recent trip to New York. From my hotel to the Google office in Chelsea and bars on the Lower East Side, this richer representation of the real world made the map much more helpful. And whenever I walked out of a building or subway station, I used compass mode to get myself quickly oriented and on my way. Check out the video below to see tilt, rotation, zoom and compass mode in action, or see more pictures. For example, I live in San Francisco and work in Mountain View, so Maps makes sure I can always pull up detailed street maps of each city and area maps for the whole San Francisco Bay Area. When I do have an Internet connection, I still get live traffic, imagery, richer map details and all the other features I’m used to with Google Maps. Rather than having a static set of maps when installed, Maps will automatically start caching the areas you visit the most when your device is plugged in and connected to WiFi (e.g., the nightly charge). We’re already hard at work improving the algorithms and technology behind these features, so over time you can expect to see maps work better in more offline situations. If you’re one of the more than 10 million people relying on Google Maps Navigation (Beta), our free turn-by-turn GPS navigation feature, losing your Internet connection can be particularly painful. (This happened to me on a recent ski trip to Tahoe, and I was left trying to manually find my way back to my route.) 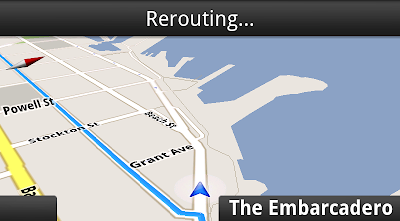 So we’re also introducing offline rerouting. You’ll still need a connection to start a route, but if you miss a turn along the way, we’ll quickly get you back on track, even if you don’t have an Internet connection. We’ll be rolling this feature out gradually over the next few weeks. Google Maps Navigation now automatically reroutes you, even if you lose your connection. Get Google Maps for mobile 5.0 by searching for Google Maps in Android Market (or tap on this link if you’re on your phone). Android 1.6+ devices can get Maps 5.0, but 3D and offline features require Android 2.0+, and some features may not be supported for all devices or countries. So try it out. 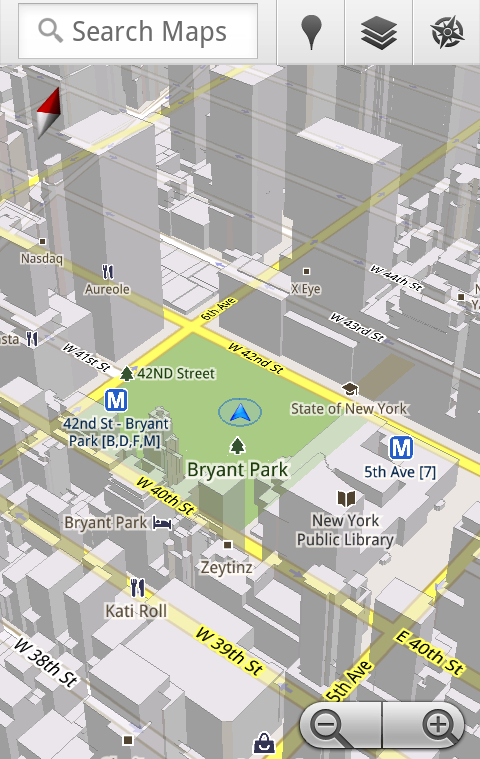 Wander around in compass mode, explore 3D buildings—even dare to open Maps on the subway! I hope you enjoy all the new features as much as we do.